This is WOW News 247: Governor Fayose Insist: President Buhari's Wife is Involved in Halliburton Fraud SCANDAL? 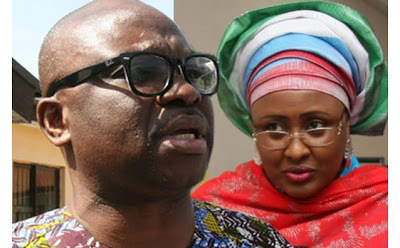 Governor Fayose Insist: President Buhari's Wife is Involved in Halliburton Fraud SCANDAL? Despite the United State government saying that it had no fraud information against Aisha Buhari, wife of the President, the Governor of Ekiti State, Ayo Fayose, has insisted that she was the one involved in the controversial Halliburton scandal. Speaking through his lawyer, Mike Ozekhome (SAN), on Wednesday, Fayose insisted that Buhari’s wife was mentioned in the Halliburton scandal. the statement regarding her alleged involvement was “correct and justified in law,” having been factually premised on an existing court judgment. The letter read: “Our client has referred to us your letter dated 22nd June, 2016, on alleged defamation of the character of your client, Her Excellency, Mrs. Aisha Buhari, the wife of Muhammadu Buhari, GCFR, with firm instructions to reply to and reject same in its entirety. “Our client states and reaffirms categorically that the statement he made as regards the involvement of Mrs. Aisha Buhari, the wife of President Buhari, in the Halliburton scandal, is correct and justified in law, having regards to a court judgment convicting one Mr. William Jefferson for bribery in the Halliburton case. EFCC said President Buhari's wife, even before he came to power, was not the Aisha Buhari involved.